Home appliances can be divided into three classifications, which includes, small appliances, major appliances, or white goods and consumer electronics, or brown goods in the United Kingdom. The division is noticeable in the maintenance and repair of these kinds of products too. Brown goods usually require high technical knowledge and skills (which get more complex with time, such as going from a soldering iron to a hot-air soldering station), while white goods may need more practical skills and force to manipulate the devices and heavy tools required to repair them. Given a broad usage, the domestic application attached to "home appliance" is tied to the definition of appliance as "an instrument or device designed for a particular use or function". More specifically, Collins English Dictionary defines "home appliance" as: "devices or machines, usually electrical, that are in your home and which you use to do jobs such as cleaning or cooking." The broad usage, afforded to the definition allows for nearly any device intended for domestic use to be a home appliance, including consumer electronics as well as stoves, refrigerators, toasters and air conditioners. While many appliances have existed for centuries, the self-contained electric or gas powered appliances are a uniquely American innovation that emerged in the twentieth century. The development of these appliances is tied to the disappearance of full-time domestic servants and the desire to reduce the time-consuming activities in pursuit of more recreational time. In the early 1900s, electric and gas appliances included washing machines, water heaters, refrigerators and sewing machines. The invention of Earl Richardson's small electric clothes iron in 1903 gave a small initial boost to the home appliance industry. In the Post–World War II economic expansion, the domestic use of dishwashers, and clothes dryers were part of a shift for convenience. Increasing discretionary income was reflected by a rise in miscellaneous home appliances. In America during the 1980s, the industry shipped $1.5 billion worth of goods each year and employed over 14,000 workers, with revenues doubling between 1982 and 1990 to $3.3 billion. Throughout this period companies merged and acquired one another to reduce research and production costs and eliminate competitors, resulting in anti-trust legislation. The United States Department of Energy reviews compliance with the National Appliance Energy Conservation Act of 1987, which required manufacturers to reduce the energy consumption of the appliances by 25% every five years. In the 1990s, the appliance industry was very consolidated, with over 90% of the products being sold by just five companies. For example, in 1991, dishwasher manufacturing market share was split between General Electric with 40% market share, Whirlpool with 31% market share, Electrolux with 20% market share, Maytag with 7% market share and Thermador with just 2% of market share. Major appliances, also known as white goods, comprise major household appliances and may include: air conditioners, dishwashers, clothes dryers, drying cabinets, freezers, refrigerators, kitchen stoves, water heaters, washing machines, trash compactors, microwave ovens, and induction cookers. White goods were typically painted or enameled white, and many of them still are. Small appliances are typically small household electrical machines, also very useful and easily carried and installed. Yet another category is used in the kitchen, including: juicers, electric mixers, meat grinders, coffee grinders, deep fryers, herb grinders, food processors, electric kettles, waffle irons, coffee makers, blenders and dough blenders, rice cookers, toasters and exhaust hoods. Entertainment and information appliances such as: home electronics, TV sets, CD, VCRs and DVD players, camcorders, still cameras, clocks, alarm clocks, computers, video game consoles, HiFi and home cinema, telephones and answering machines are classified as "brown goods". Some such appliances were traditionally finished with genuine or imitation wood, hence the name. This has become rare but the name has stuck, even for goods that are unlikely ever to have had a wooden case (e.g. camcorders). There is a trend of networking home appliances together, and combining their controls and key functions. For instance, energy distribution could be managed more evenly so that when a washing machine is on, an oven can go into a delayed start mode, or vice versa. Or, a washing machine and clothes dryer could share information about load characteristics (gentle/normal, light/full), and synchronize their finish times so the wet laundry does not have to wait before being put in the dryer. Additionally, some manufacturers of home appliances are quickly beginning to place hardware that enables Internet connectivity in home appliances to allow for remote control, automation, communication with other home appliances, and more functionality enabling connected cooking. Internet-connected home appliances were especially prevalent during recent Consumer Electronic Show events. Appliance recycling consists of dismantling waste home appliances and scrapping their parts for reuse. The main types of appliances that are recycled are T.V.s, refrigerators, air conditioners, washing machines, and computers. It involves disassembly, removal of hazardous components and destruction of the equipment to recover materials, generally by shredding, sorting and grading. ^ "appliance (definition)". Merriam-Webster. Retrieved 4 May 2015. ^ "white goods". Collins English Dictionary. Retrieved 5 December 2014. ^ "brown goods". Collins English Dictionary. Retrieved 5 December 2014. ^ "Appliance". Merriam Webster. Retrieved 24 July 2013. ^ "Definition of household appliances". Collins Dictionary. Retrieved 24 July 2013. ^ a b c d e Bulletin, Manila (9 November 2014). "Tips to ensure safety of home appliances". Manila Bulletin. Archived from the original on 5 May 2015. Retrieved 5 May 2015. ^ a b c Encyclopedia of American Industries Volume 1. Gale Research. 1994. ^ a b c d e f "Efficient Appliances Save Energy -- and Money". Natural Resources Defense Council. Retrieved 4 May 2015. ^ "White Goods". www.icfdc.com. Data monitor, Static.scrib. Retrieved 6 May 2015. ^ a b c d Jubis, Vanessa (23 December 2012). "Unclutter Your Life: Clearing the Kitchen Counter of Unnecessary Small Appliances". Huffington Post. Retrieved 5 May 2015. ^ a b "Best Small Appliances - Small Appliance Reviews". Consumer Reports. 29 May 2014. Retrieved 5 May 2015. ^ a b Michelle, Bangert (1 September 2014). "Getting Smarter All the Time: The Appliance Landscape Continues to Evolve with the Rise of Internet-Connected Devices". Appliance Design. BNP Media. Archived from the original on 24 September 2015. Retrieved 5 May 2015 – via HighBeam. (Subscription required (help)). ^ Essers, Loek. "Home appliance makers connect with open source 'Internet of things' project". Computerworld. Retrieved 5 May 2015. ^ Baguley, Richard; McDonald, Colin. "Appliance Science: The Internet of Toasters (and other things)". CNET. Retrieved 5 May 2015. ^ Hitchcox, Alan (February 2015). "The Internet of uncertainty". Hydraulics & Pneumatics. 68 (2): 8. ^ "Appliances of the Future Will Be Able to 'Talk' over Internet". The Mercury. 15 January 2015. Archived from the original on 24 September 2015. Retrieved 5 May 2015 – via HighBeam. (Subscription required (help)). ^ Buekens, A.; Yang, J. (2014). "Recycling of WEEE plastics: A review". The Journal of Material Cycles and Waste Management. 16 (3): 415–434. doi:10.1007/s10163-014-0241-2. Du, Z. (2012). "The Application Research of Small Home Appliance Product Based on Computer Aided Ergonomics". Proceedings of the 2012 International Conference of Modern Computer Science and Applications. Advances in Intelligent Systems and Computing. Springer. pp. 522–528. ISBN 978-3-642-33030-8. Kriske, Rob; Kriske, Mary (July/August 1984). "Home Appliance Repair". Mother Earth News. Accessed May 2015. "New computerized home appliance to assist with caring for the elderly". Rockdale Citizen. 8 April 2015. Retrieved 5 May 2015. 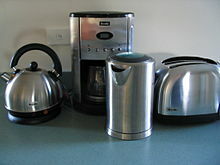 Wikimedia Commons has media related to Home appliances. Look up household appliance in Wiktionary, the free dictionary.